One of the most fascinating topics to come up in our industry these days is how real-money gambling is slowly but surely beginning to make its way into the precious gaming space. Despite the attempts to merge the two worlds, though, gaming and gambling have always been typically seen as two separate entities: except for all of those poker or slot machine video games that let players raise the stakes with imaginary currency. But in fact, now it seems that the lines have begun to blur so much in recent years that one organization in Australia has decided to take action. A new South Australia government-affiliated marketing campaign has recently begun to crop up around the land down under called Gambling is No Game, and stylized as NO GAME. Their main argument is that, in today’s digital culture, it’s entirely normal for younger children to become fully accustomed to moving around on a smartphone or iPad, and playing various video games with certain mechanics that simulate real world gambling. Naturally, this research has led NO GAME to the conclusion that gambling-simulated gaming in one’s early years can translate into real world gambling in their later years. The homepage of the NO GAME website warns parents that “Games that simulate gambling give children the opportunity to practice gambling. Playing these games often becomes a daily activity making gambling seem like part of normal everyday life.” It also offers a list of things to look out for in teenagers and younger children who might be crossing the line from gaming to gambling, as well as unearthing the roots of the problem and offering advice on what parents can do if they witness a similar behavior pattern in their own gaming kids. 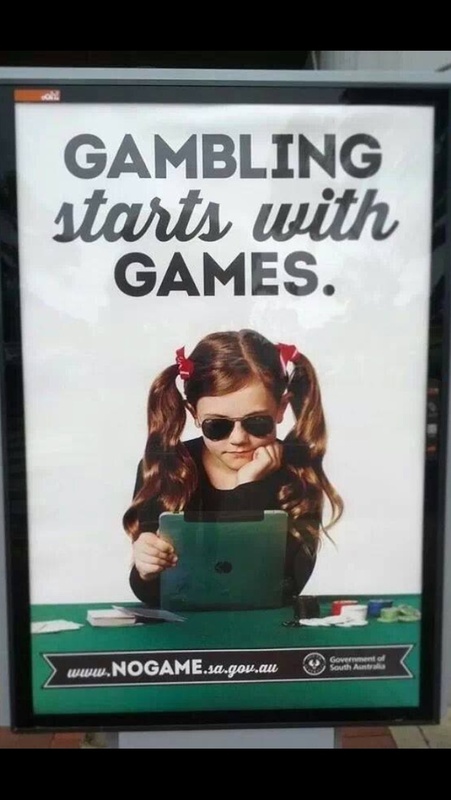 As stark as the initial marketing campaign may be (including full color ads seen at various public places like bus stops depicting a little girl sitting at a poker table and holding an iPad with shady sunglasses on, underneath the headline “Gambling starts with games”), there’s still no denying that it gives us something to think about. After all, I can easily see someone who has grown up playing games with unlimited imaginary currency running up a similar tab at a Las Vegas casino, but with heaps of real money now on the table. I’ve personally been playing video games for all of my life, and I don’t enjoy real money gambling or even visiting casinos in the slightest. But it’s also readily apparent how fast that real world money can disappear after a couple hands of Blackjack, for those that do happen to like placing bets on a game of cards or two: just ask my Dad about that one. So do you see any of the same correlations between your own gaming and gambling habits? Do you think Australia has a valid reason for their concerns, or is this just another example of video games taking the blame in the media?